Let us ease the pressure of shopping for various Christmas gifts from multiple shops. 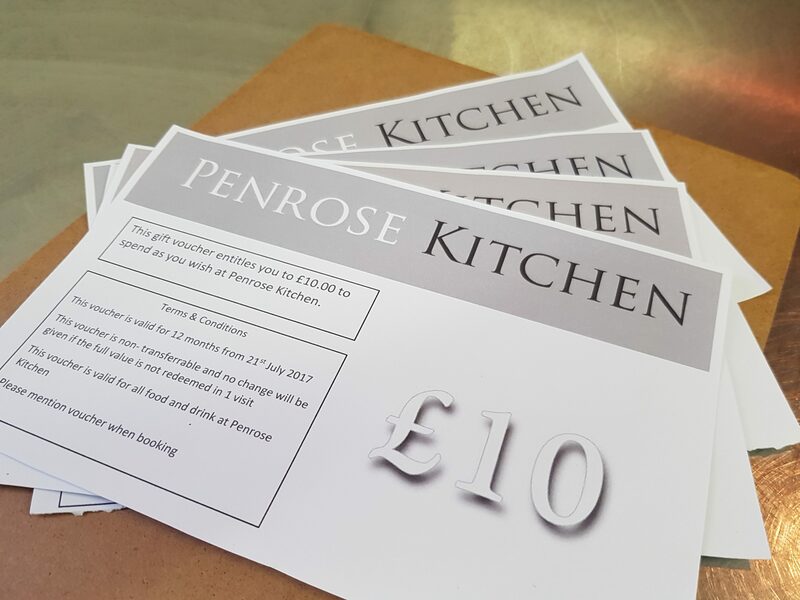 Penrose Kitchen gift vouchers make ideal Christmas gifts for all of your foodie friends. And with the festive season being such a busy time for everyone this is something that can be saved for another special occasion throughout the year. Whilst some may see a voucher as an easy option, getting the right voucher for the right person from the right establishment makes it a more personal and well thought out gift. All of our vouchers are printed in house so that we can print bespoke vouchers which could be for a specified amount, a particular item, a particular date and all with a personal note to give it that extra special touch. Gift vouchers can be bought in any denomination from £10.00 – £100.00 and be purchased via telephone (£1.00 p&p) or email with a card payment. If you pop in to buy your gifts you could treat yourself too whilst we print! Terms & conditions do apply to our gift vouchers and these are clearly printed on them.